The Gentry is a flexible, minimal and feminine WordPress theme. The Gentry is a flexible, minimal and feminine WordPress theme with a feminine look with an artisanal quality from Angie Makes. The content is in focus with this theme, the minimalist styled user interface uses simple lines and pastel based colors. Giving the theme its relaxed, artsy and hand-crafted quality. In terms of features, the Gentry’s comes with a responsive, flexible, full-width slider that can feature any posts, post categories, or images. Blog posts on the homepage or blog pages can be in a grid, excerpt, masonry, and other layout formats. The Gentry uses the WordPress Customizer for customization and it comes with loads of options. Uploading of custom fonts can be done directly from Customizer and you can customize font / color /padding settings for almost all the elements in the theme. And on the more advanced side, you can toggle the responsive trigger width for the menu, adjust site widths and add custom CSS. Upon purchasing the theme, you will also receive access to video tutorials, Automatic Theme Updates from within your WordPress dashboard and Support From the Angie Makes team.We note that fonts and images as design elements plays an important part to add character to themes the Gentry. Angie Makes also sells beautiful graphics and fonts on their store for you to make use on the website. 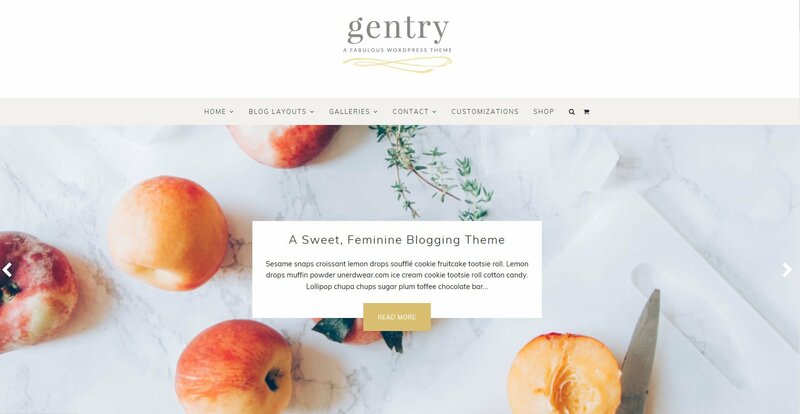 And although Gentry is marketed as a feminine WordPress blogging theme, we think it is appeals to a large majority versatile and suitable for a variety of purposes (craft shops / cake shops for example).